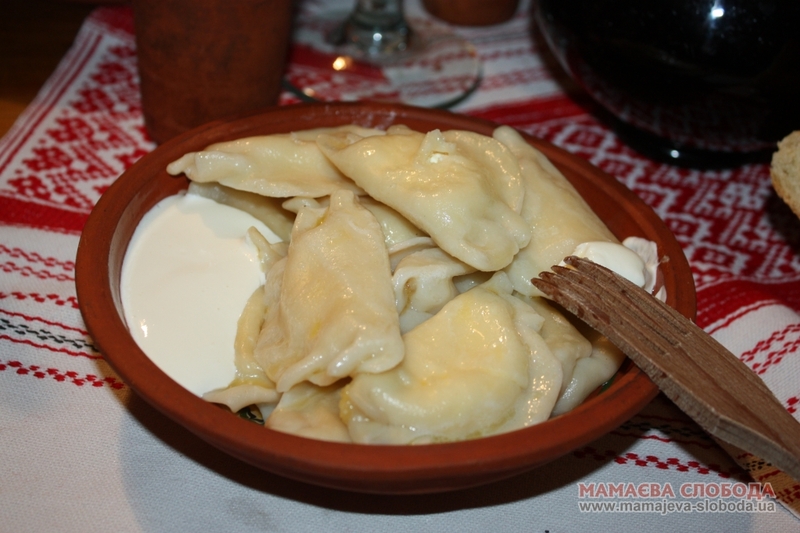 Varenyky (dumplings) with sweet curds (cottage cheese) | Шинок "Коса над Чаркою"
One of the most ancient traditional Ukrainian ritual dishes. This dish was cooked to honor the young moon and woman’s fertility. ‘Varenyky’ is a ritual dish of ancient Ukrainians, which might has come to us from Trypillian times. The young moon symbolized woman’s beginning and dumping was its personification. As soon as the young moon appeared in the sky, our great grandparents had to pray to have good luck for the whole future month. In order to please the moon and to have welfare, it was presented with dumplings as a gift. The stuffing of the dumplings symbolized a mother to be, and so far the continuation of the keen. For example dumplings stuffed with millet, in those times symbolized the future harvest, mushroom stuffing served for the man’s strength, while fish served the woman’s. Dumplings stuffed with chopped boiled eggs and greenery was endowed with great life-giving strength; those stuffed with poppy seeds symbolized the variety of worlds and star world; dumplings with cherries were believed to be magic… Special attention was paid to the dumplings stuffed with cottage cheese, as cottage cheese is a dairy product and our ancestors believed milk to be the symbol of growing of the wealth. Boiled dumplings were taken out of the water with the help of the twig colander and were put into glazed bowl, and then they were immediately smeared with melted butter, in order not to stick together. The bowl was covered with a towel (till the next portion was put there). The next dumplings were taken and put into the same bowl and were also smeared with butter. When all the dumplings were ready they were mixed by tossing, usually it was done by a man. As a rule this dish was served in the bowl, and sour cream or fermented boiled milk was put nearby, as well as honey or sugar for the sweet tooth.